No matter what it might be, everyone trusts in something or in someone. We bet our health, happiness, and even our lives on all kinds of people every day, ranging from our family members and friends to people we do not know, such as airline pilots and the workers who make our cars. If we refused to trust anyone with our well-being, we simply could not live in society. At the very heart of our faith as Orthodox Christians stands our deep trust in a Person, our Lord, God, and Savior Jesus Christ. By His Cross, our Savior has conquered sin and death and made it possible for us all to become participants in eternal life. To believe in the power of His Cross is not simply to affirm that Christ died upon it or to be able to describe in words why it is important to our faith. No, to believe and trust in Christ’s Cross is to bet our lives on His sacrificial offering. It is to think, act, and speak from our hearts in ways that manifest our Lord’s way of holy, loving obedience. It is for the Cross to become the deep truth of our lives. And even as no one forced or required the Savior to accept the Cross, no one forces us to take up our crosses or to follow on His path of selfless love. Whether in first-century Palestine or twenty-first century America, the way of the Cross is neither popular nor easy; it naturally attracts no one. We should never forget that the Romans nailed people to crosses in order to make them die painful, slow deaths. They publically humiliated and tortured them as a reminder to everyone else of what they would do to their enemies. Who would be attracted to that? St. Paul recognized the offense of the Cross by calling it a stumbling block to the Jews and folly to the Gentiles. In other words, the Jews were hoping for a conventional political and military leader to conquer their earthly enemies, not One who would die a shameful death at the hands of the Romans. For Gentiles, crucifixion was the most disgraceful way to die; consequently, it made no sense to worship someone who died like that. But St. Paul experienced personally the new life that the crucified and risen Savior has brought to the world. He knew in his soul the power and wisdom of God that seems like foolishness and weakness to those who live and die by the false gods of this world. He proclaimed One so strong and righteous that He overcame the very worst that corrupt political and religious leaders could do to Him. St. Paul trusted this Lord and literally bet his life on Him by eventually dying as a martyr. Perhaps we have heard the story of Christ’s crucifixion so many times that we have lost our sense of shock and horror about the public torture and execution of the incarnate Son of God. This was not only the death of an innocent human being, but the slaughter of the God-Man. The One Who spoke the universe into existence became the Passover Lamb that takes away the sins of the world through His sacrifice. The One Who is “Holy, Holy, Holy” accepted the very worst misery and punishment that fallen humanity could devise in order to save us. 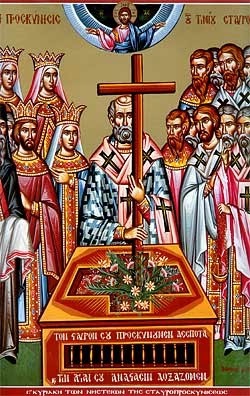 Those who worship the false gods of power, wealth, and pleasure continue to view Him and His Cross as foolish and weak. But those who like St. Paul have experienced in their souls the wisdom and power of God know better. This is not the kind of knowledge that confirms that “two plus two equals four,” but the kind of knowledge that comes only from trust, love, and personal encounter. True spiritual knowledge roots in the soul and is the stuff of experience, not abstract thoughts. Even those who claim that power, wealth, and pleasure are the ultimate truths of life do so not because they are particularly intelligent, but because they love power, wealth, and pleasure. They have given their lives to them and that is how they see the world. Likewise, there is no path to the knowledge of the power of the Cross without taking up our crosses, without serving Christ through lives of obedience and sacrificial love. We must entrust ourselves to Him if we are to know Him and the power of His Cross. To trust the Lord in this way is not simply to have religious thoughts and feelings. Think of what it means really to trust another human being who is very close to you. It is not simply about occasional words, thoughts, or even deeds, but an ongoing relationship that changes us, requires something of us daily, and opens our eyes to new dimensions of who this person is and of who we may become. If we truly love someone, we sacrifice for them in meaningful ways on an ongoing basis. So if you wonder why the Church calls us to pray, fast, forgive, repent, give to the needy, and lead pure and righteous lives, here is an important part of the answer. It is through such practices, done with faith and humility, that we strengthen our relationship with Jesus Christ. We know and experience the Lord by entrusting ourselves to Him through practical steps that we take every day in serving Him and our neighbors in Whom He is present.